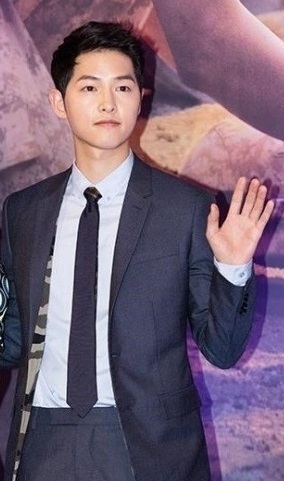 Song Joong-ki dropped a stick of entertainment media dynamite on the country early Wednesday morning with the news he would marry his former costar, stunning fans and media alike and proving once again why he is one of the hottest young actors in Korea. He and Song Hye-kyo jointly announced via their agencies that they would get hitched on Oct. 31, after repeatedly denying that they were in a romantic relationship. It was only the latest in the series of headlines about Song, having rocked the nation with his acting skills, charm and boyish good looks since rising to stardom in 2010. In his youth, Song sought to become a star skater before an injury got the better of him. Known as a model student in his school days, he was discovered by Sidus HQ while in college and trained to become an actor. His official debut in 2008 was nothing spectacular, landing a small role in 2008 period piece “A Frozen Flower.” Song took on several minor roles before his breakout role in the historical drama, “Sungkyunkwan Scandal” in 2010. While he played a supporting role, his interpretation of an affluent, playful and free-spirited young man of the Joseon era captivated fans. His career went into hiatus in 2013, when he enlisted for his mandatory military service as an able-bodied Korean man. “I received the script just two days before I was promoted to the rank of sergeant (in the military), and I couldn’t help but do it,” Song said in a press conference held before the show began airing. His popularity was such that former President Park Geun-hye went out of her way to compliment Song, instructing her aides to create a video about his life and put a life-sized photo in front of the entrance of K-Style Hub, a facility set to promote Korean pop culture. Park even publicly praised “Descendants of the Sun” as the most successful case of her key “Creative Economy” policy. Song, co-star Song Hye-kyo and scripter Kim Eun-sook all received presidential commendations in October of 2016. The Song couple also shared the grand prize at last year’s KBS Drama Awards. Behind all the attention and honors, the Song-Song couple had actually become a couple in real life, a rumor that was finally confirmed Wednesday. Despite multiple reports that the two were seen dating in New York, then in Bali at an exclusive resort, the actors had either claimed it was a coincidence or outright denied the reports as groundless. Before the wedding, Song will make another splash in the film industry when “Battleship Island” hits theaters on July 26. The picture is already the talk of the town because of the subject matter -- forced Korean labor by the Japanese during World War II -- and the controversy that some of its extras were exploited by the producers.